Go into your Edit HTML (Design tab). Make sure to save your template before starting. The code is a meta tag, which is HTML that goes between the <head> and </ head> tags in your main template. You will have to Control/Command F to find the <head>. Paste the code in and save. This code affects your entire blog...not just per post. And, of course, readers can still right click and save your images or take image shots. Remember, if it's on the internet anyone can steal it. What other things do you wish Pinterest did or didn't allow? That's good to know. I think it would be a good idea if the repin button linked to the original source and you pin from the actual web page. That way, the repins are always only one pin deep and there is no losing of the source. I think that is what Pinterest "technically" meant to happen. But people get lazy and don't take time to research where the images come from. I have found a lot of lost original sources lately. It's a bad habit! Thank you for your comment SheilaG! Thanks so much, you always have such great info and interesting/pertinent topics! Ooh, what kind of recipes? You can search to see who has pinned your blog images directly from your blog, but not individual items. Have you tried searching "recipes"? Just scroll down toward the bottom where it says "pin it button for websites". 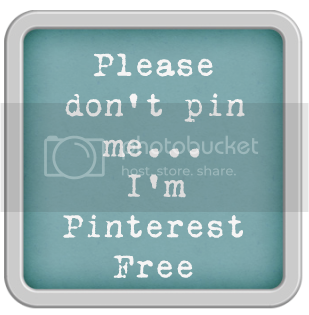 This is a great tool for those people that do not want their images Pinned. I personally wish more people would pin my items from Etsy or my blog, but hey that's just me! Great articles, thank you. Maybe suggest to readers to pin your stuff? Write an article on pinning and etiquette maybe? That'll get them thinking! I love when people pin my stuff! :) But this is a great and informative post. Ok... I tried adding the code to my blog, but it didn't work... Can you tell me exactly where to put it so that people can't pin from my blog? Thanks! I've never been Pinned that I know of. I thought Pinterest sent you an e-mail? Maybe you only need to search who has Pinned you when you get Pinned a lot. In my dreams!! This code would be great for those who have family blogs that are public, but prefer to not have their family photos pinned. Thanks for the tip! Where's the code for the Pinterist-free button? Eleanor, just right click and save image to use the button. I just found you via Mod Vintage Life. You offer some great information, and I cannot wait to get back to your site and read all of it. I found an article about Pinterest via LinkedIn that I re-posted on one of my blogs, and it is very scary. It seems that we can be sued for posting others' photos. You do make a good point, though, that if you put it out there, anyone can copy it. I just don't post any photos that I mind people pinning. I like Pinterest a lot, and I haven't shut mine down yet, but I might. I already left FB for various privacy reasons.